The terminus of the year-round passenger ferry from Fleetwood. The port of Fleetwood was developed from 1830, and early ferries which ran across the River Wyre were powered by oar and sail. In 1841, the Croft family organised a ferry service, running from the beaches on either side of the river. The first meeting to propose a steam Fleetwood-Knott End ferry service was held in 1851, but is was not until 1892 that the Fleetwood Improvement Commissioners reached agreement with the Lancashire and Yorkshire railway to build a ferry jetty at Fleetwood. 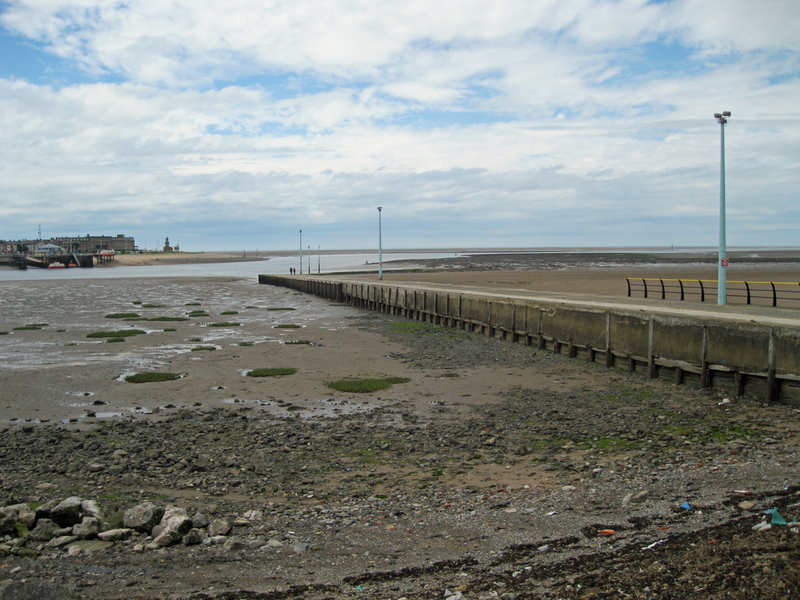 Agreement was then made with the local landowner to gain access at Knott End. The Ferry Committee of the Improvement Act District of Fleetwood (predecessors of the Fleetwood Urban District Council) assumed responsibility for the ferries in 1893, but leased the operation to local operators, initially Newsham & Myerscroft. In 1894, a steam launch Nelson was being used for the ferry. From 1895-98, the Croft family regained control of the ferries. In 1925 the famous Wyresdale arrived, which became the primary vessel for over thirty years. The smaller Pilling assisted with off-peak services. Wyredale was 54 gross tons and 63 feet long, and steam reciprocating machinery powered twin screws. She was built by James Robertson of Fleetwood. In 1935 she was joined by the slightly smaller motor vessel Lunevale (62 feet long, 46 gross tons), and in 1941 the small Caldervale (30 feet, 23 gross tons) replaced the Pilling. Wyresdale suffered a tragic boiler explosion in 1957, and three people were killed. I believed her scrapped at the time, but some years later discovered her again at Glasson Dock. She had been used for excursions at Morecambe, fitted with new diesel engines. In 1966, the ferry Viking 66 was built by Charles Martin at Rockferry, and she maintained the service for many years. The council chartered local boats when she was not available. For a number of years, Viking 66 was joined by the larger Wyre Lady, which had previously served on the River Clyde. By the mid-1980s, Wyre Lady had gone, and Viking 66 was run by Bird's Sea Fishing, later CAS Birds and Bay Boating Company. Most of their boats were open fishing launches, but by 1995 they had the excursion vessel Lady Victoria Belle, which had a small cabin and upper deck. She operated trips on the river and along the coast. The Knott End ferry was generally operated by the Wonder at this period. The late 1990s and early 2000s were turbulent times for the ferry, with a succession of operators running the service (usually summer only), including Wyre Boat Services, and Swift Offshore Services (with the Wyre Princess). The service was suspended in 2001, and the local excursion operators appear to have disappeared too. By 2003, the service had restarted with Wyre Marine Services, using the ferry Harvester. The service operated from April 7th to October 31st in 2004, with a half hourly service between 8am and 6pm. The service is funded by both Lancashire County Council and Wyre Borough Council. The brand new vessel has been running since 2006.